Large dams all over the world provide necessary services such as hydropower, flood protection, and water security. The iconic Hoover Dam, for example, generates enough hydropower to serve 1.3 million people. Large dams have been estimated to contribute to more than one-tenth of the world’s food production. But large dams also profoundly alter the freshwater ecosystems they’re built in. Fish and other native river species have evolved to thrive among particular natural patterns of river flow that provide cues for migration and reproduction. Large dams interrupt these cues, which can interfere with the life cycles of native species. Worse, these disruptions can lead to newly-suitable habitat for harmful invasive species. It’s no wonder that dams are one of the leading causes in the decline of freshwater species the world over. The only hope for restoring rivers entirely would be to remove dams entirely, but that simply isn’t going to happen; our livelihoods depend on this towering infrastructure. So how can we balance our need for water against maintaining the river-flow patterns that sustain freshwater ecosystems downstream of dams, especially in a changing climate? In recent research published in Nature Communications, my colleagues at the University of Washington and I looked at potential improvements in dam operations in the hopes of avoiding a world of dwindling water and invaded rivers. We chose to study the Navajo Dam constructed in the San Juan River. This is a major tributary of the Colorado River that flows through New Mexico, Colorado, and Utah. And this river system made for the perfect case study as it epitomizes the water conflicts that arid regions of the world are facing. 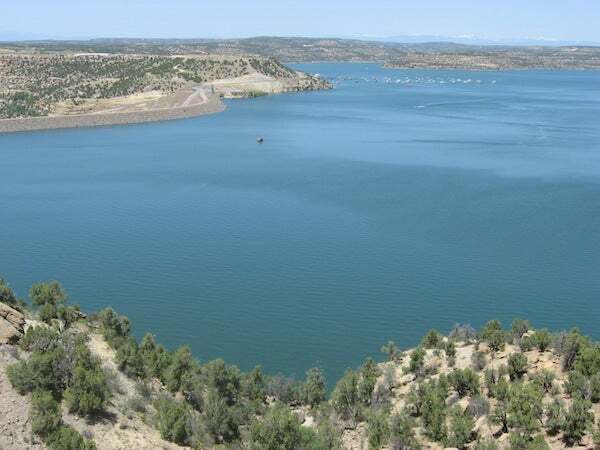 On the one hand, the reservoir created by the Navajo Dam holds a capacity of over 1.7 million acre-feet of water (the volume of around 850 football stadiums), which is essential for agriculture in the region. But on the other hand, the San Juan River is home to multiple endangered, native fish species, such as Colorado pikeminnow and razorback suckers. The construction of the Navajo Dam enables multiple invasive fish to thrive, including common carp and channel catfish, which compete with native adults for food and prey on the juvenile fish. Colorado pikeminnow and razorback suckers were put on the Endangered Species Act list in part because of these invaders. We wanted to know: Is it possible to have a triple-win of meeting agricultural water needs, benefiting native fish species, and deterring invasive fish species? We used decades of data on river flow patterns and fish populations in the San Juan River to predict how native and invasive fish populations would grow or decline in response to increased river flow. By comparing these predictions with when residents needed to divert water from the San Juan River, we could determine not only how much water should be released from Navajo Dam, but also when these releases should happen to benefit native fish while creating a hostile environment for invasive fish. Designing water releases in this way would also ensure that we met agricultural water needs. The key to our successful solutions was differences in how native and invasive fish populations responded to increased river flow at various times of year. Our predictions for fish responses were laid out to a daily time scale. For example, we found that releasing water in the late winter benefited native fish. Releasing water during the late summer was more harmful to invasive species, though it did harm native species a little, too. One of the leading standards for restoring rivers degraded by dams is to restore the river flows that were present prior to dam construction. But if we want dams to provide us with water and energy, we cannot chase a “natural state” that is impossible to return to. Fortunately, we can do better. Our prescribed water release solutions are a far cry from how the San Juan River naturally flowed. However, we predict that for the current state of the river, our river flow patterns are superior. Even better, we predicted that there was enough water to meet agricultural needs and benefit native fish, even when water was scarce—a situation that is becoming more common with climate change. The mathematical tools we leveraged are not revolutionary. Amazon Prime uses similar tools to make sure your order gets to you within the promised two days. Airlines use similar algorithms to gauge how much they can overbook and still have enough seats on their planes for all the passengers that show up. However, we are applying these methods in new ways to optimize our use of natural resources while minimizing our harm to the environment. No amount of clever design will eliminate the impact that dams have on freshwater ecosystems. Fine-tuning the flow of water downstream, as we propose, will not single-handedly address how dams block fish movement, create reservoirs that emit striking amounts of methane into our atmosphere, and promote invasive species that thrive in altered freshwater environments. But we and other scientists are working to minimize the harmful environmental impacts of large dams while recognizing that modern society relies on these structures. Perhaps we can have our water and drink it, too. William Chen is a mathematician, ecologist, and environmental writer based in Seattle.